“Old” Wynnstay was a large place of Georgian date, with a library rich in Welsh MSS, without architectural features. It was burnt to the ground in 1859. A “Queen Anne” house, which had taken the place of a “black and white” timbered manor-house, proceeded the Georgian edifice. The present unfinished mansion is designed after the style of a French Chateau. Ferry was the architect. Wynnstay was originally called “Watstay”, from the famous Watts’ Dyke, the remains of which can still be traced in the park. It was owned in the 16th. century by the family of Evans. 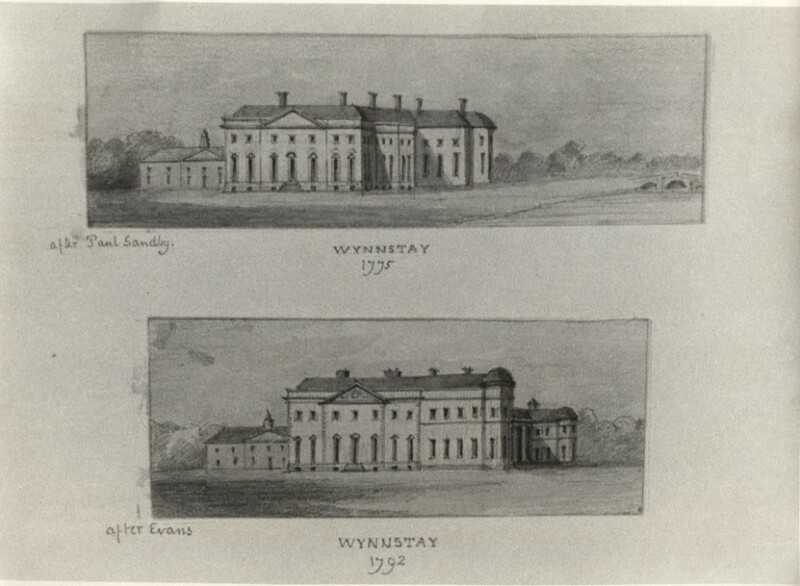 The estate passed by marriage to the Wynns of Gwydyr, and in 1740 to Sir Watkin Williams, who assumed the additional name of Wynn. He was grandson to Speaker Williams.